Paul and Patty Thurner began "growing" Dog Services Unlimited in 1969, when Paul started conducting obedience training classes in the Hacienda Heights area. Paul's popular teaching style and effective methods quickly attracted people from surrounding communities, and the Hacienda Hills Dog Obedience Club was born. Soon Paul and Patty were teaching in cities throughout the San Gabriel Valley, and they began carefully to recruit instructors for their steadily expanding class offerings. In 1974, they incorprated and established the business name Dog Services Unlimited. Under this name they operated a successful dog food and supply delivery business, and continued to expand the base of their training programs. Through the years, dozens of cities throughout Southern California have confidently relied on Dog Services Unlimited/Hacienda Hills Dog Obedience Club to instruct group obedience and other dog-related classes through Parks & Recreation Departments. Today, our group includes ten professional trainers who have decades of experience instructing with us! HACIENDA HILLS DOG OBEDIENCE CLUB! Carol passed away in October 2016, following a long illness. 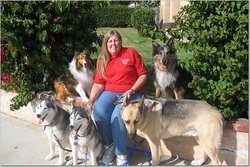 Carol's expertise in dog training stemmed from a variety of experiences, including working with German Shepherds (her personal favorite), and volunteering at Mission Viejo Animal Shelter and San Clemente Animal Shelter, where she worked with many dogs to help make them more adoptable. She also served as behavior consultant for several rescue groups. In her nearly three decades working with Dog Services Unlimited, Carol was a stellar instructor, compassionate trainer, and wonderful friend to her colleagues and students across South Orange County. She is missed by all. 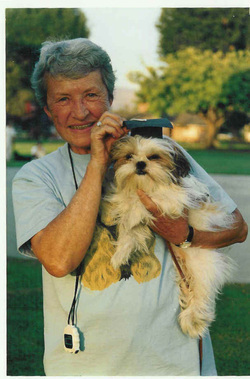 Our longtime trainer and friend, Marie Charpentier, passed away in early 2014.
during her 15+ years with Dog Services Unlimited. She is greatly missed.